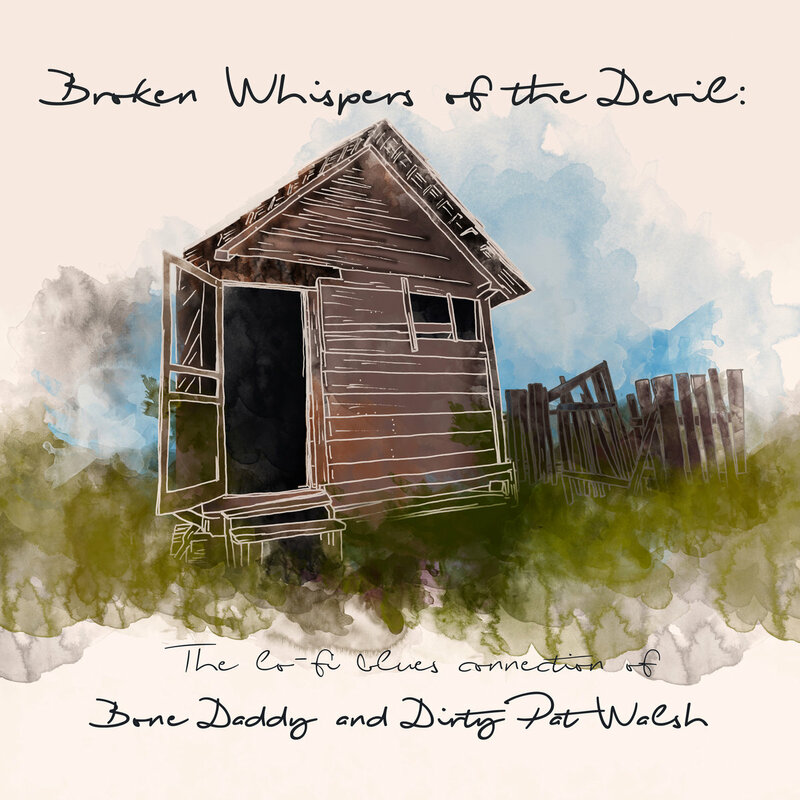 Broken Whispers of the Devil: The lo - fi blues connection of Bone Daddy and Dirty Pat Walsh is a new release on Mirkwood Recordings, and it must be one of the longest titles for any musick release I have ever seen. It's just an EP though, clocking in at around 20 minutes from six tracks split between the two artists named. I previously talked about Dirty Pat Walsh when I reviewed Maelstrom Boogie by his band Hurricane Charlie. I'm interested in seeing this other version of him, acoustic, instead of the furious garage rocker on that other release. I don't like the cover art of Broken Whispers of the Devil. It doesn't even fit with the musick from how I see it. It's certainly very lo-fi and rough, a dream-like mistiness to it, however, it's so digital looking. From the script font with its pseudo-handwritten look to the sketchy-but-too-clean drawing, in white, of an old shack, it really doesn't fit the old-timey tone of the musick itself. The first track, "Still Rainin'" by Bone Daddy, is really lo-fi. It's kind of painful to listen to, all sharp treble with the guitar pretty loud. The song is okay, typical blues in the way most people think of blues musick. Dirty Pat Walsh's "In the Broken Alley" is a little better. It has a much fuller and more resonant sound; it doesn't hurt my head. I like the loose, Robert Johnson playing style. The song is a little more unusual too, using a lot of imagery of lights. "Ain't Confessin'" is another noisy Bone Daddy track with an intro that sounds like it might be from a news program on TV. This one isn't as piercing, but it's still very trebly. I don't enjoy listening to it, due to the extreme lo-fidelity. It's a very repetitive song, instrumentally, too. "Of This Evening" is an alright track by Dirty Pat Walsh. It has a cool overall tone, a sort of walnut sound, and a cool intersection of notes are played. It's just the right length at a little over 2 minutes too. "I Just Wanna Make Love to You" is a song by the blues master, Willie Dixon, originally recorded by Muddy Waters. This version, by Bone Daddy, is pretty good. It's raw with that classic Willie Dixon magick that I can't really describe. I love the break in the middle; it provides the perfect amount of tension. "Tomorrow May Not Be Worth Dreaming Of" is the final track, another by Dirty Pat Walsh. It's a more subdued piece compared with the rest of the album. The musick is extremely minimal and quiet with loud vocals. The singing is pretty rough. "As the standard slaughters the sublime" is an great and interesting chorus though. Broken Whispers of the Devil is certainly a work of art, a product with a specific focus that doesn't seem to care if it is molded in its own best interest. That's reality; that's the blues. I respect this, but I don't necessarily like it. There are certainly some good tracks, about half of them, but the production really makes this a pain to listen to. I really dislike the cover art as well - it almost looks unfinished, and it doesn't fit the musick. I have to give Broken Whispers of the Devil a Neutral.